The morning part of Whangaparāoa Road's dynamic lane control trial will start at 6am on Wednesday 18 April. Taking on board feedback from the community and considering available traffic flow data, Auckland Transport (AT) is running the trial from 6am to 9am instead of starting at 6.30am as originally planned. What is a dynamic lane? 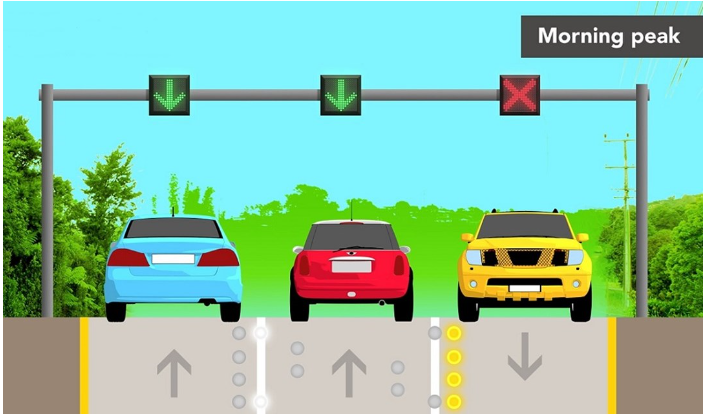 The dynamic lane concept, similar to tidal flow lanes, uses the existing road more efficiently for motorists. It is an innovative solution using traffic control devices and an adaptive LED light system, instead of traditional painted on road-markings. LED lights act as road markings that can change configuration quickly and safely, creating an extra lane during peak hour traffic. Traffic control gantries clearly display which lanes motorists are to use. The trial has already shown an improvement to PM peak traffic flow. Travel times have been reduced and there is less queuing on the Hibiscus Coast Highway, which has a positive impact on traffic flow heading towards Ōrewa. Randhir Karma, Group Manager Network Management and Safety at AT, is pleased with how the afternoon peak has operated. "The launch of the morning peak dynamic lanes should help ease congestion between Whangaparāoa and the city centre," he says. "Although we do expect there to be some improvement in the morning, we don't expect it to be as effective as the afternoon peak due to the volume of vehicles merging into the left-turn lane at the Hibiscus Coast Highway." The Hibiscus Coast Highway intersection will allow two lanes of traffic to turn towards the city centre. Cars will be able to turn left at the intersection as well as using the existing slip lane. Large vehicles such as trucks and buses are restricted to using only the slip lane. Since the start of the trial, there have been calls to extend the trial to the morning peak. "We were just as eager as road users to make use of the whole dynamic lane control system, but it was important to make sure the system was safe and efficient before the extension," says Mr Karma. Once the trial has been successfully completed, AT will continue operating dynamic lanes on Whangaparāoa Road and look into using it in other parts of Auckland.